When I became a homeowner and again when I became the mom of a girl with long hair I began to realize it was time to learn some DIY tricks for simple at home problems. To be a little more specific bathroom drain problems. My daughter likes to brush her hair standing over the top of the bathroom sink. She also has a habit of dropping her toothpaste in the sink and then just washing the whole clump down instead of breaking it up first. You know like you would if you actually used it! Mix the two together and the end result is disaster in your drains. Fortunately over the year's I've learned that I don't have to call a professional to take care of a simple hair clogged drain. For once I actually get to be the "professional" and hero! All with a little help from my friends over at Roto-Rooter. I'll be honest Roto-Rooter Gel Clog Remover has become my best friend when it comes to clogged drains. And honestly it couldn't be any easier. Just dump about 16oz down the drain. Sit patiently (or clean the counters like I do) for about 10 minutes. Then follow it up with lots of hot water. And there you have it a clear drain! Of course for those really tough clogs there's always the chance you may need to repeat the process more than once. Thankfully I've never had a clog that bad and one time has always worked for me. What can clog a drain? When it comes to bathroom drains your main issues will most likely be toothpaste, hair (from brushing and shaving) , the occasional earring back or other small jewelry that tends to slip out of your hands, and even soap. How do you unclog those drains? Although some clogs will require a plumber to be called it's always best to give Roto-Rooter Gel Clog Remover a shot first. I would say most times this will be the only solution required. 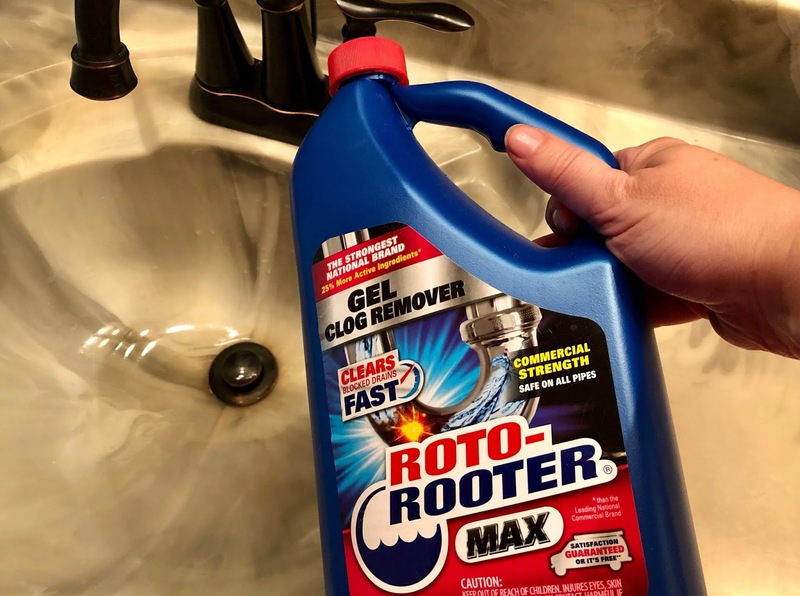 Independent lab tests have proven that Roto-Rooter Gel Clog Remover clears tough clogs faster than other national brands. This is due to our Professional gel formula with 25% more active ingredients than the competition, and the precise viscosity to power through standing water to remove all types of stubborn clogs, hair, soap scum and grease. Roto-Rooter Gel Clog Remover is safe to use in all pipes, septic systems and garbage disposals.